Enjoy the warm embrace of The Shamrock Arms – a 4 Star Guest Lodge offering good value, tranquil surroundings and wholesome food. 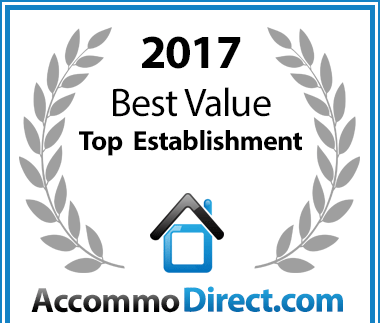 For accommodation in Waterval Boven Shamrock Arms Guest Lodge has been voted a Best Value establishment. Superbly situated on the Mpumalanga Highlands Meander Route – a mere two and a half hour drive from Johannesburg – and clasped by the picturesque and historic village of Waterval Boven / Emgwenya - you are guaranteed a country-village ambience that will soothe your soul. It is an ideal stopover for the business and leisure traveler on route to the Kruger National Park, the Panorama Route or Mozambique. Shamrock Arms is also the perfect base from which to explore many places of interest and scenic beauty in Mpumalanga. Your host, Terry, an accredited and registered tourist guide can offer guidance on any tourist related matters. On offer are superbly furnished rooms with their own outside entrances, double or twin beds, an en-suite bath or shower, DSTV with decoder, air-conditioning (hot and cold), electric blanket (optional in winter), stocked mini-bar, complimentary tea tray and electronic safe. Free WIFI is available in all of the rooms including the dining and pub area. A Continental or full English breakfast is served either on the verandah or dining room. A ‘packed breakfast’ is available to those guests wishing to depart early in the morning. A wholesome home-cooked meal for dinner is available on request. Unwind in our cosy pub and take advantage of a good selection of South African wines. A sincere and friendly welcome awaits you from your hosts – Terry, Cheryl, Jaco & Sue.